totally looked like SKII or dress or watch editorial eh? I don't wanna spoil too much and upload too much photos on my Instagram first because I wanna save the best for my blog. Blogging is my passion and my way of sharing things with my readers and I want you guys to have the feeling of surprise everytime reading my blog. Hence I keep controlling myself and don't upload the photos first. 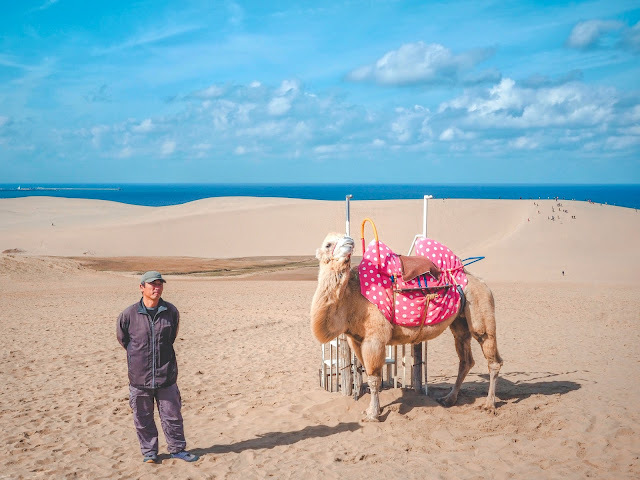 When Japan is quite mind blowing for me (koi fish in drain, autumn leaves, outdoor mixed onsen etc), I never thought I'll encounter sand dunes and camels this trip. I was like: WHAT!??? What is happening right now? I feel like I'm in a wrong dimension or something. 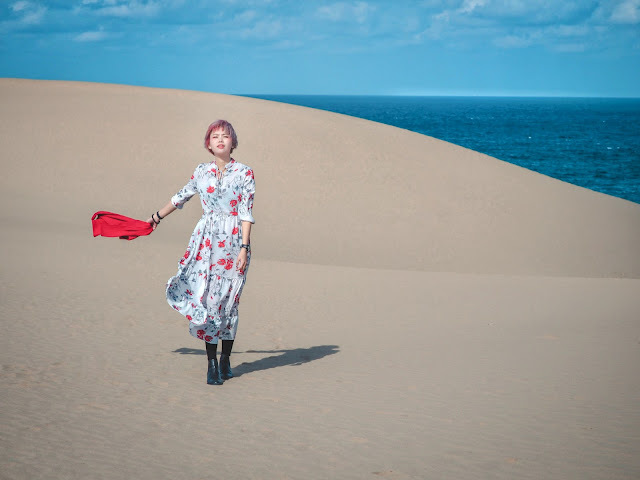 There's sea, sand dunes, and also camels when I'm wearing heat tech underneath my dress enjoying the chilly weather. 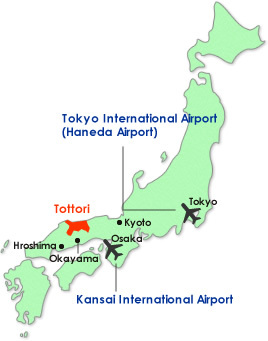 So where's Tottori in Japan? 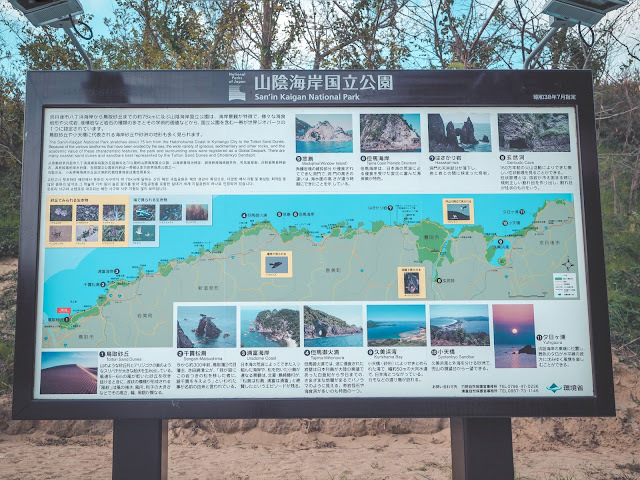 The fare cost about 7000yen and takes about two hours and thirty minutes, then you'll reach JR Tottori Station which is located at Eastern Tottori. Mostly people will choose to visit Tottori when they're visiting Japan's Kansai area (because it's more convenient with the JRWest rail pass and such). 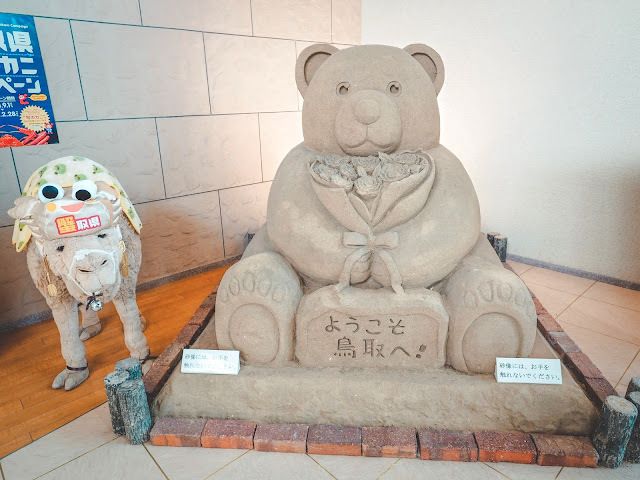 But if you just feeling to tour around Tottori, fret not as Tottori has launched their 2000YEN! TOTTORI CITY TOURIST TAXI program where you can go for all-you-can-ride taxi service for 3 hours. Definitely worth the price because it will be convenient for you to go to Tottori Sand Dunes, San'In Coast and other tourist attraction spots without worrying bus schedule, weather or luggages. do write them an email for more information! Regular City Bus: one way ride costs about 370yen. Hourly departure at bus stop #0 in front of Tottori Station. Kirin Jishi Loop Busループ麒麟獅子バス : operate on weekends, public holidays and summer holidays (July 20th - August 31st) Two type courses of bus available. A Course Bus will take about 25minutes to Sand Dunes and B Course Bus will take about an hour to Sand Dunes. Departure every 1-2hours. Bus fare costs about 300yen per ride or 600yen for one day pass. 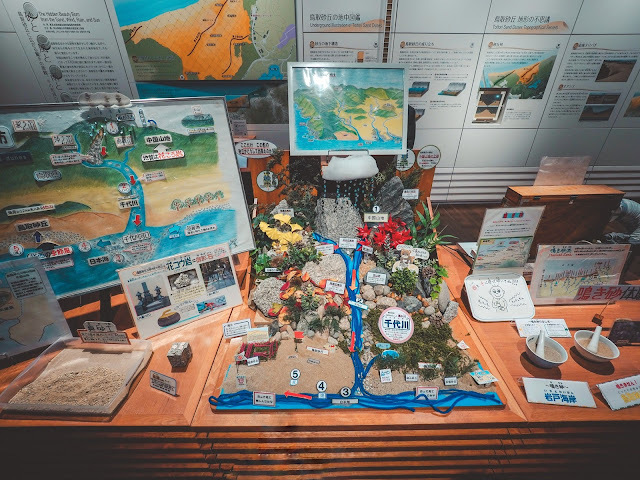 Get your one day pass at Tottori Bus Terminal, on the bus or Tottori City Tourist Information Centre. 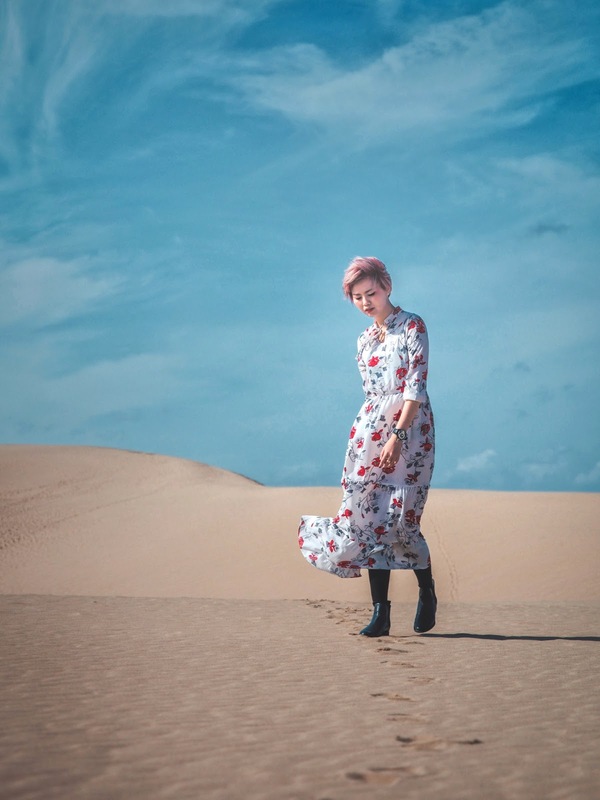 Being the largest sand dunes in Japan and Tottori's No.1 tourist spot, Tottori Sand Dunes is breathtaking. The sand dunes' span is approximately 16.4 kilometres and up to 2 kilometres wide and 50 meters tall. 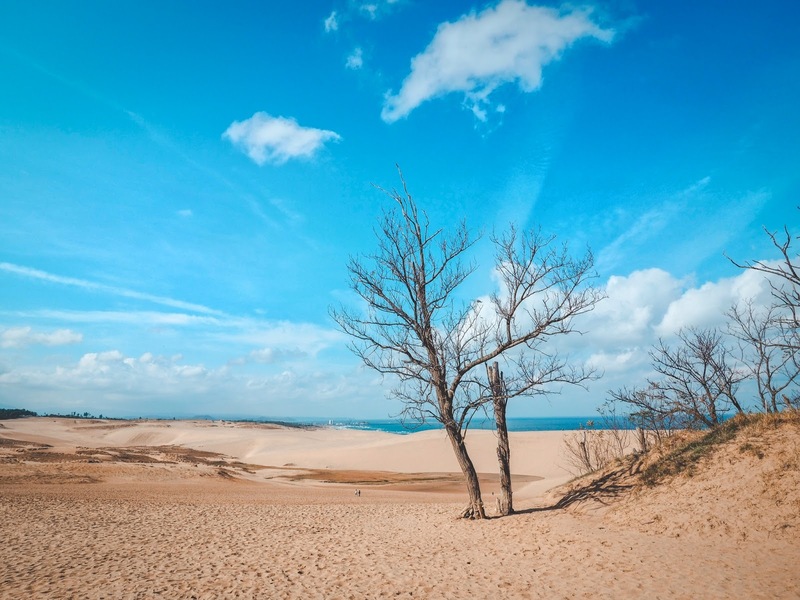 The sand dunes were formed since thousands of years ago became how it is today. 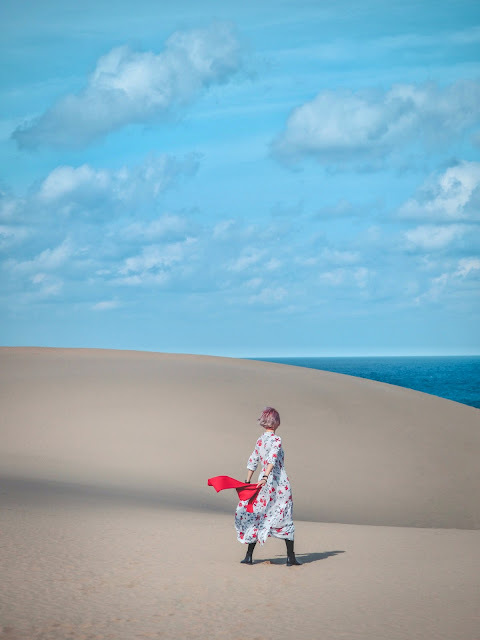 Still, the constant tides and winds movement are continously changing and forming the shape of sand dunes, the landscape of this place is ever changing. 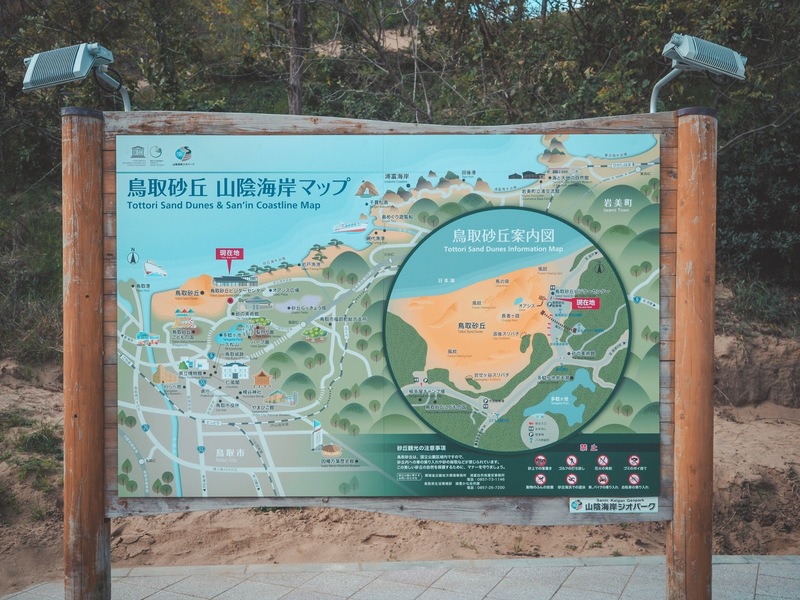 To understand more about this magical place, we visited the newly opened Tottori Sand Dunes Visitor Centre and mini theatre that's located just right outside the sand dunes area. For foreigners, you can request to scan a QR code to access the visitor centre's wifi and application that is multilingual for your better understanding. I love how lively the exhibits are presented to visitors to increase the interests of understandings and for these knowledges to stuck in our brain. Instead of just casual writings on the wall, there are these artwork that reminds me a lot of my favourite art class. 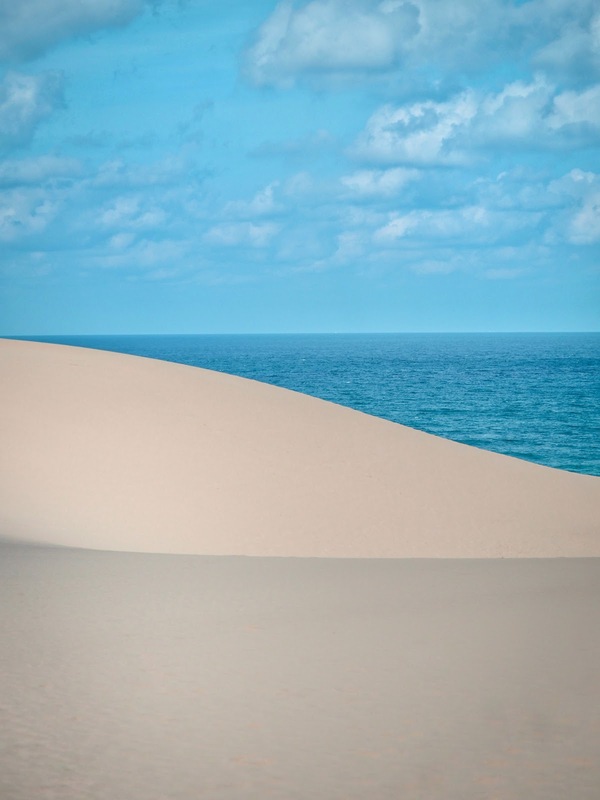 From the artwork we can see clearly how the sand dunes were formed thousand years ago. I bet kids would understand very well too! Ahhh I miss those art craft making times a lot. 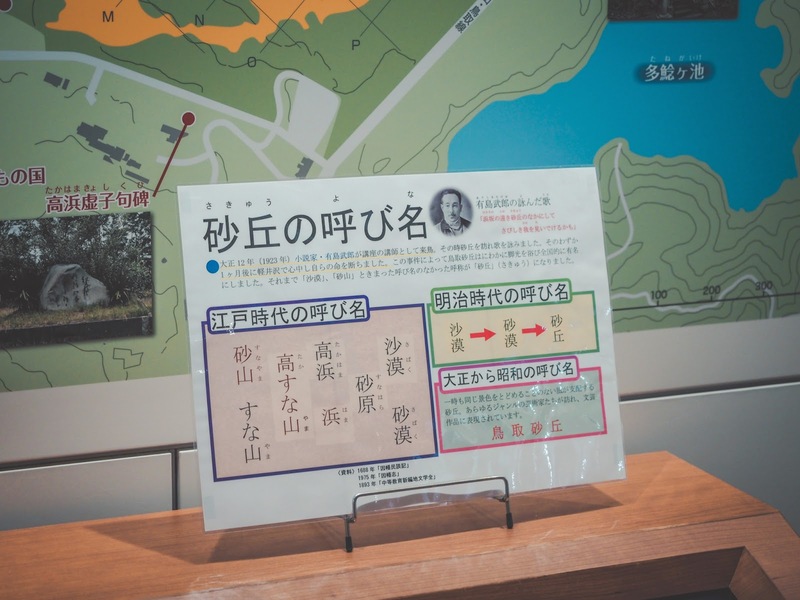 I've witnessed first hand how much importance were placed in visitors' questions at visitor centres and Japanese translator. I've lost count at times our translator will go all out to get answer for my seemingly silly questions that just pop up in my brain. Yet, each and every questions were answered perfectly for my understandings and I've learned so much throughout this trip. Same goes to the management who manages Tottori Sand Dunes! Those details in the visitor centre showed how much tender, love and care to the place. 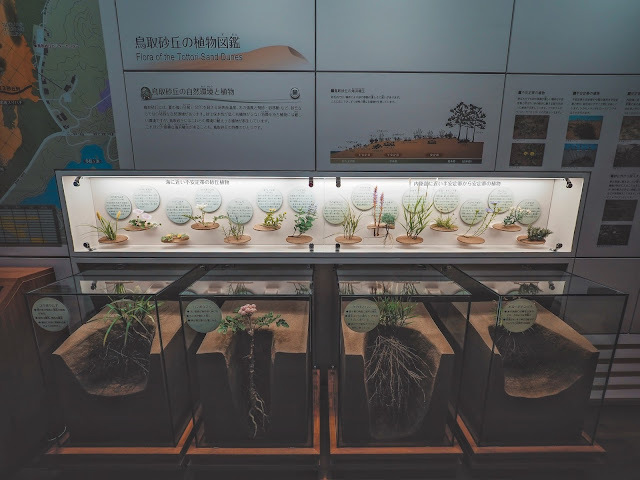 You get to see plants that grows at the sand dunes, as well as insect figurines that indicates these insects live at the sand dunes area. These details really amaze me to bits. After visiting the visitor centre, we're off to see the sand dunes! 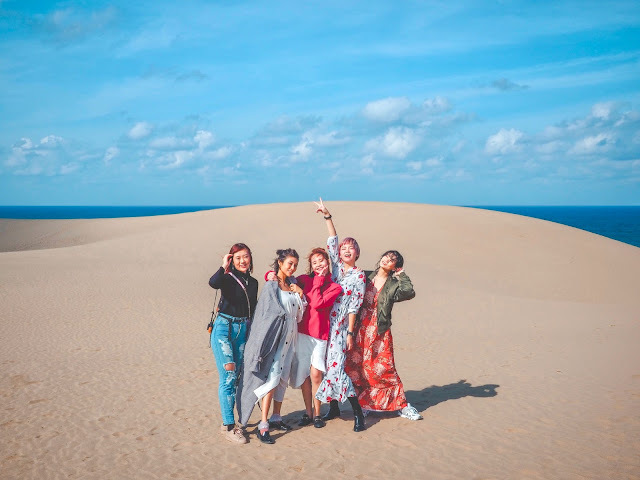 If you don't want to walk around the sand dunes with your shoes (some ladies may have their high heels on), there is this boots rental counter that's located at the Sand Dunes' Municipal Hall just right at the car park area. For the less fortunate group, there are free wheelchair service available for your sand dunes visit convenience that the wheelchair comes in special type of wheel that's suitable for sand. You can borrow the wheel chair at the visitor centre. 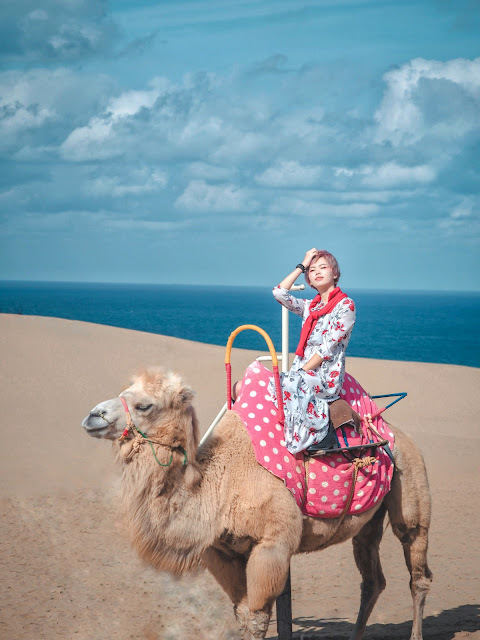 Our spotlight of this sand dunes visiting will be the camel riding experience. This is the first time I encounter camels not in an enclosure and first time riding a camel. 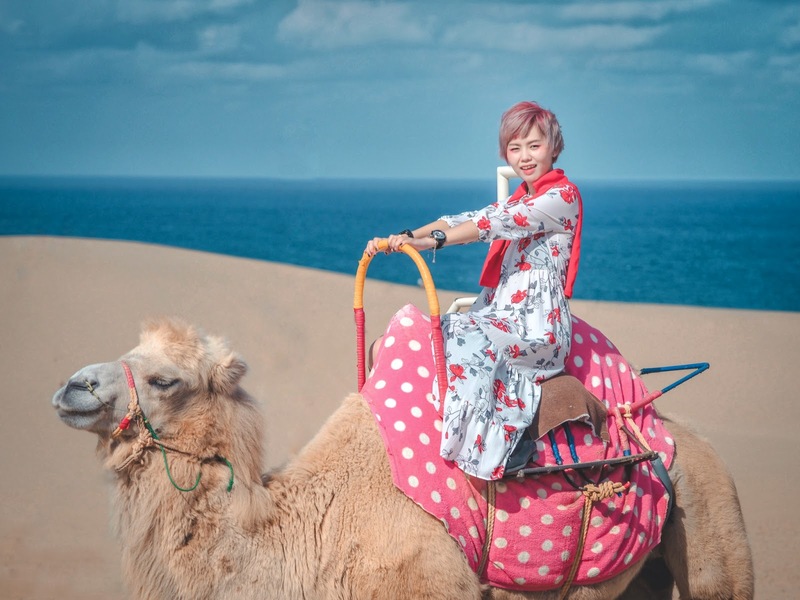 These camels are tame and cute and comes with cute accessories too! Camel's name is Lisa. Super duper cute! The fare of riding a camel isn't that expensive. It costs about 1300yen per pax. 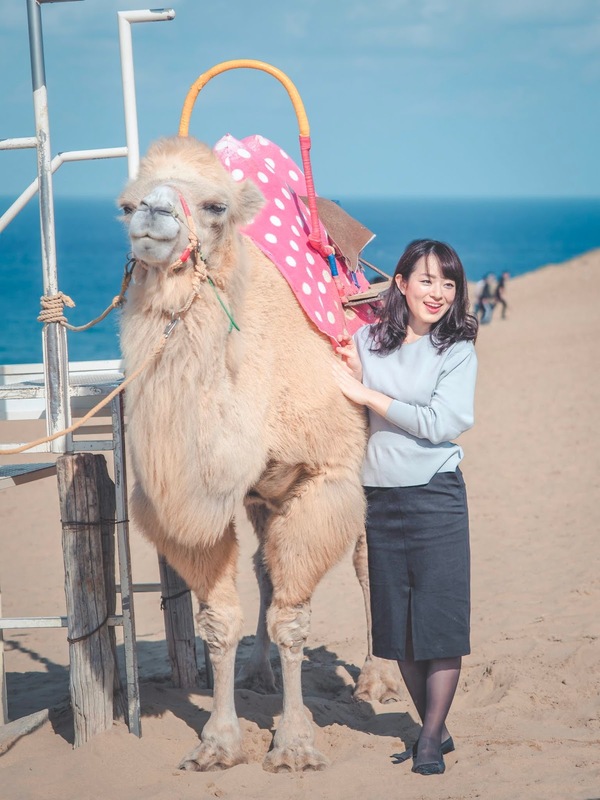 If you're not a fan of riding these furry animals, you can also take photos with it by standing beside the camel (100yen per person), or ride on the camel (500yen per person). 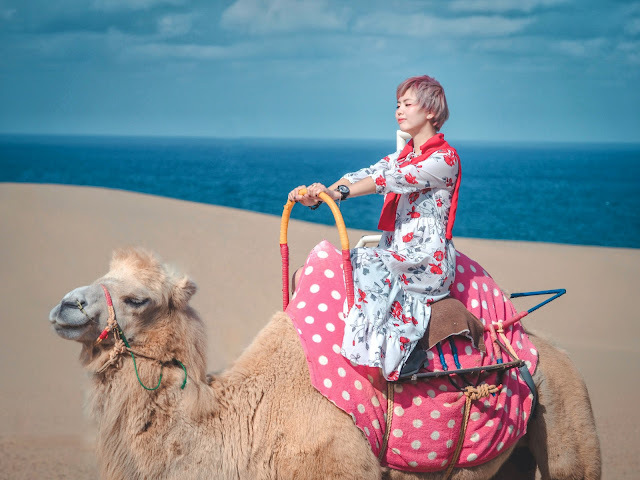 We all opted for the 500yen riding camel photo taking session. Japanese girl all so pretty looking! The sand dunes will always packed with people at the background while you're taking photos riding on the camel hence a long lens tight frame shot will help you focus more on the subject (person riding the camel) and blurred out the background for easy editing. In this case, I change my lens to Olympus M.Zuiko 40-150mm F2.8 PRO lens that I brought along this trip and stand some distance away so I can include the camel and person riding on the camel into the frame. One thing I like about my Olympus camera is while other girls camera encountering the over-exposure problem (totally white out at the subject area), my camera managed to capture perfect details with vibrant colours as well. Hence I helped all the girls took photos and save mine for last. 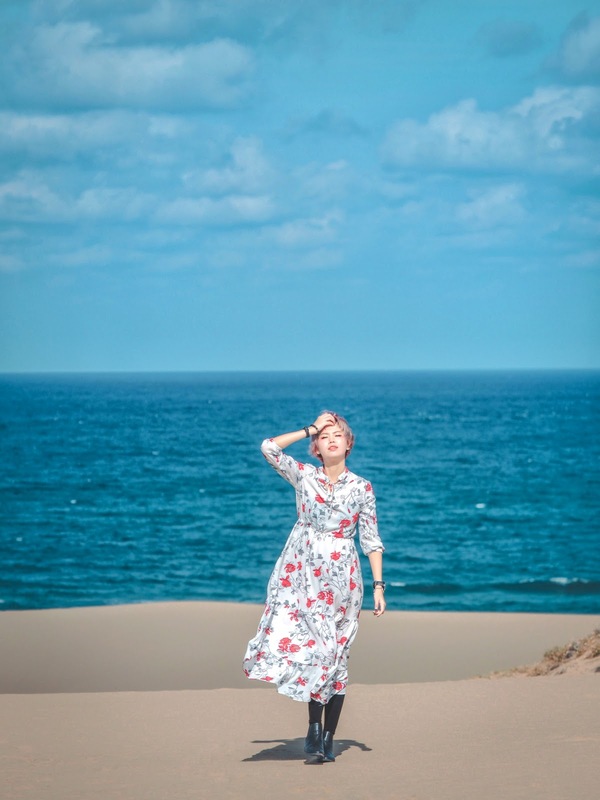 Thank you Chanwon for helping me out with taking this set of photos! Love each and every frame of it! After camel riding excitement, here starts the real sand dunes adventure where you let your heart guide you to look around and feel the energy the atmosphere brings. In this case, its scenery is soul-healing. 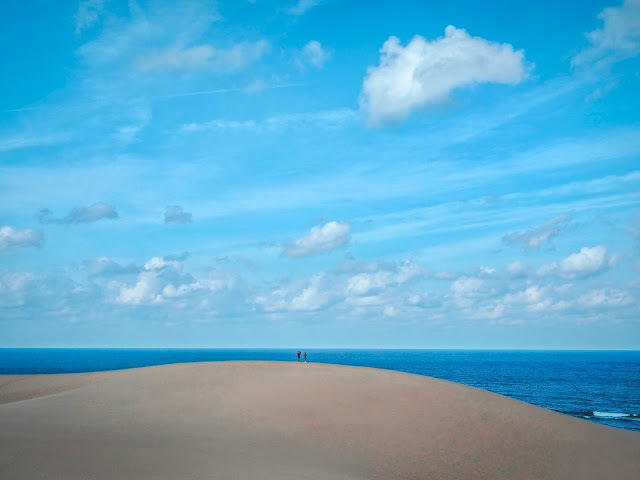 Blue sky, white clouds, blue sea which you can occasionally hear the sea waves and also people who walked around the sand dunes. I think I can sit at this place whole day enjoying the sea breeze and chilly autumn wind while looking at all these. 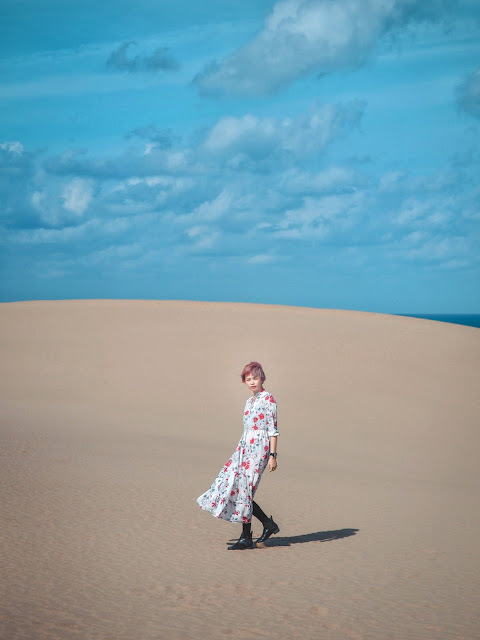 Tottori Sand Dunes looked different during each season and I just found out that it'll snow in winter. 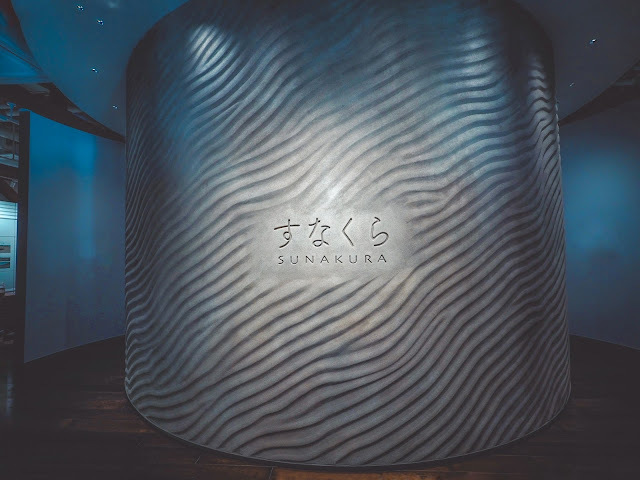 Imagine this whole place covered in fluffy powder snow as well as unique powder snow waves scenery that can't be seen elsewhere in Japan! 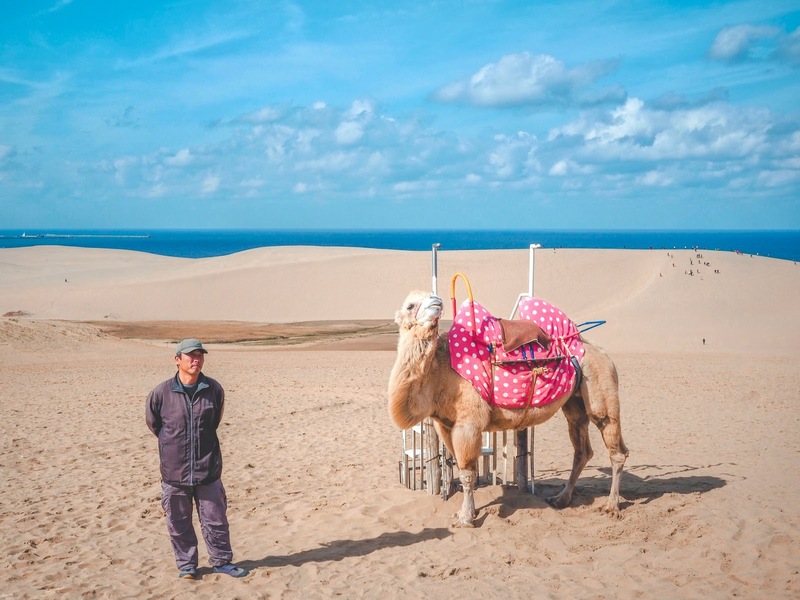 I bet watching sunset from The Horse Back (Uma-No-Se) spot which is the highest peak of the sand dunes will be one amazing life experience too! 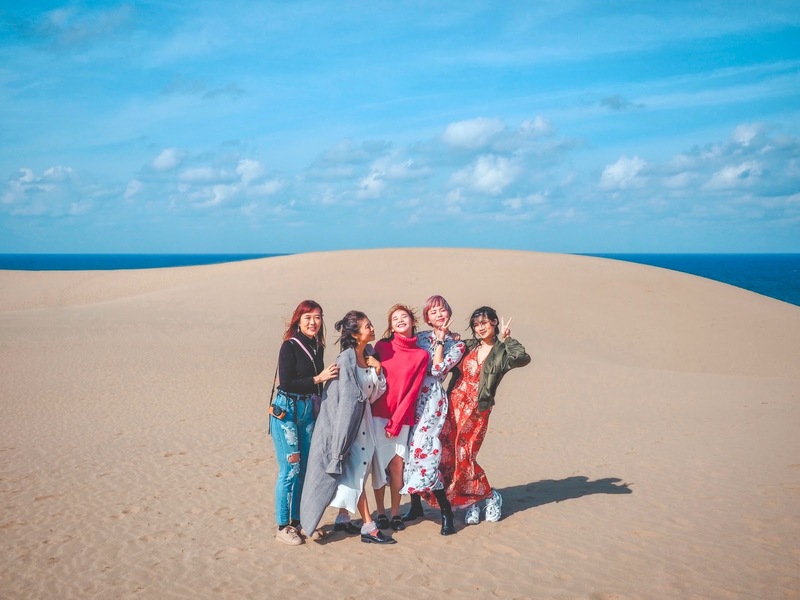 If you LOVEEEEEE to take photos like me and the girls, do allocate more time at this place to explore because you can never take enough of photos here. It seems the sky changes each and every second, every perspective of the sand dunes is super fashion editorial looking too. And my fashion tips? 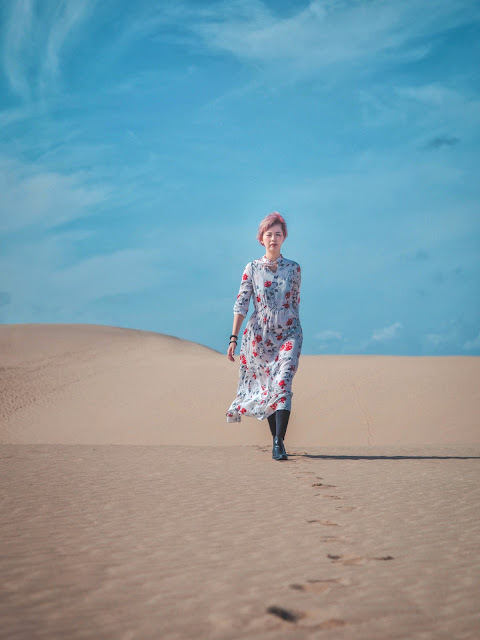 Wear white/striking colours like red/fuschia pink/orange long dress that has flowy hems to achieve dramatic photo effects! And my dress is definitely not long enough! 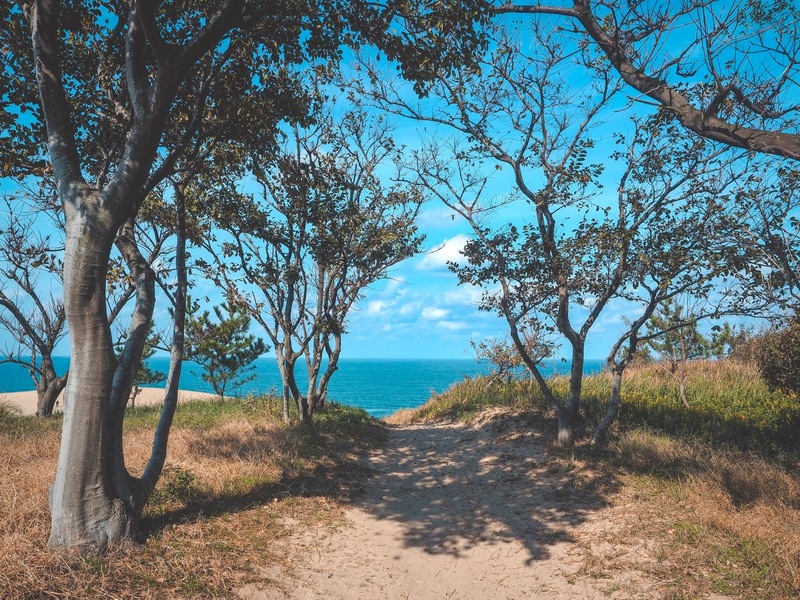 Head to the car park area and find a small route that leads to the sand dunes nearer to the beach. It's less crowded and you can see a lot sand waves/wind ripples at that location like all the photos I took above! 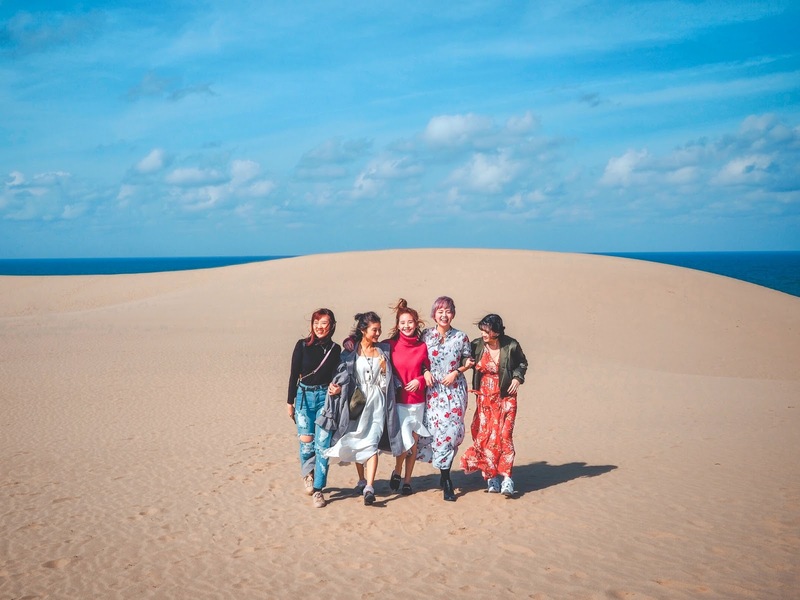 Me and the girls (Arisa, Chanwon, Cheesie and Fish) had so much fun here at the Sand Dunes. We took like 9368204629264 of photos which we later uploaded into Google Drive and it ate up all my storage space lolololol. Thank you girls for being kind, cheerful, supportive and fun in every possible way! Also a big thank you to Kumi-san, our Japanese translator who helped us capture our group photos everytime! 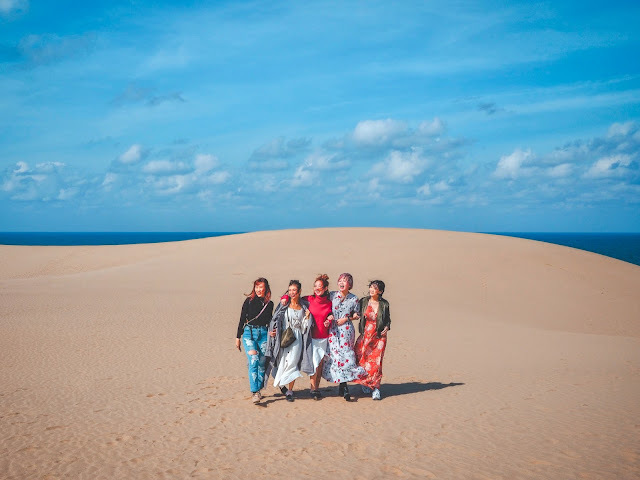 Aside from camel riding, photo taking at the sand dunes, you can check out the oasis area to discover the plants that grow at this place, take off your shoes and walk around on the sand barefooted and FEEL! 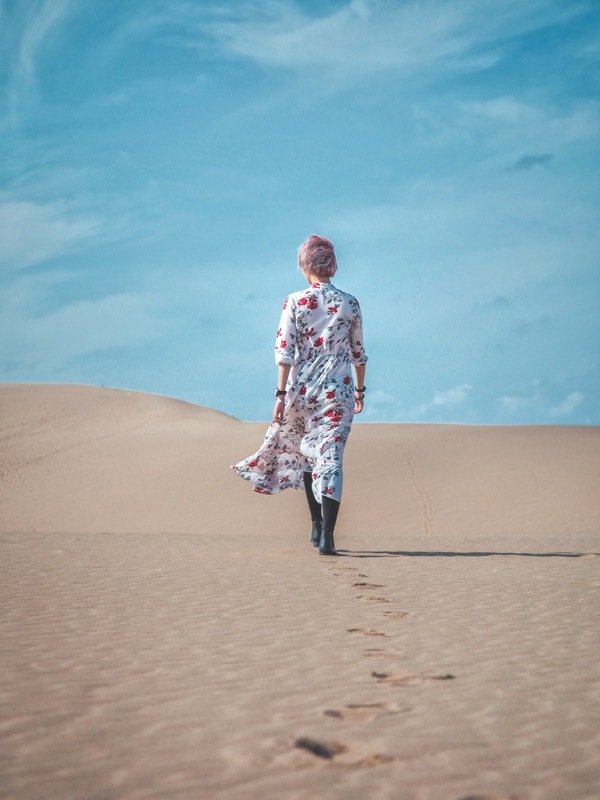 For those who are more adventurous, there's sand boarding and paragliding which is fun and lesser risk because sand dunes has no trees or pillars that blocks your way. Oh yes, did I mention you can do yoga activities here too? It's available in the morning, afternoon or night where you can yoga while watching the stars! 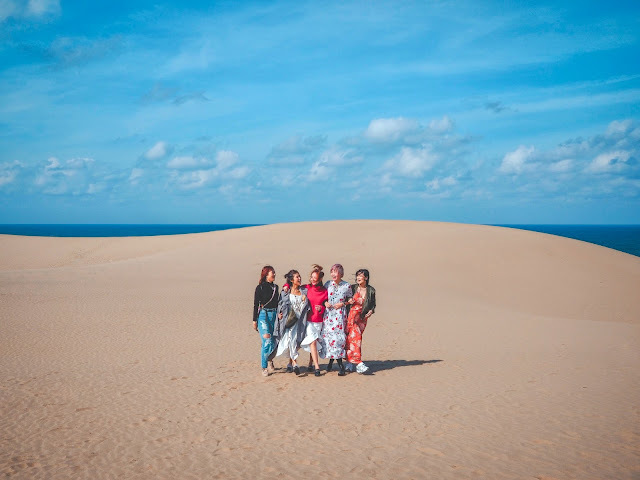 I do hope I can visit Tottori Sand Dunes again in the future with ample of time allocated and experience all these wonderful activities at one go! You totally should do it too!